What If Every McDonald’s Had Really Good Bike Parking? If you’re “bike aware” (and likely you are because you’re reading this blog) and have ever visited a fast food restaurant you’ve undoubtedly seen bikes haphazardly parked to anything secure all around the restaurant site. A vast majority of these bikes are undoubtedly owned by members of restaurant staff who depend on their bikes to get to their jobs in the restaurant. Knowing that a number of their employees rely on a bike to get to work everyday, one would think that these fast food restaurants would provided some official organized bicycle parking that preferably meets the basic APBP bike parking standards. Unfortunately this is almost always not the case and the sight of bikes parked to whatever the owner can find is common sight not only in New Jersey but at most fast food and chain sit-down restaurants all across the country. So this is why we ask, “What would it say to America if McDonalds became ‘Bike Friendly’?” We are not picking on McDonalds. Far from it! We focus on McDonalds because they are clearly the industry leader and we respect them for that. If McDonalds makes the move to standardize bike parking for their employees and guests, WalkBikeJersey believes that it would send a message across the entire restaurant industry. 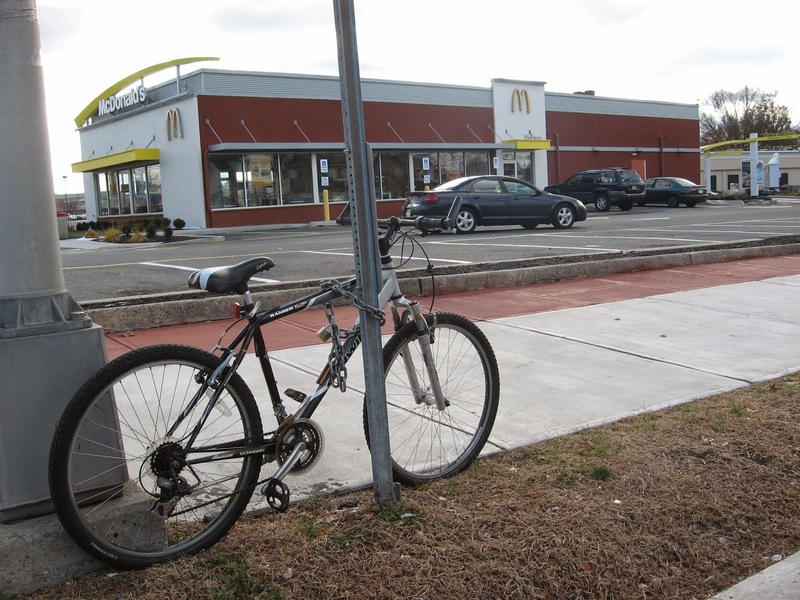 Their engineering consultants that do their local site plans would also be educated about proper bike parking design and hopefully the message would get out to the towns that do the site plan review and then possibly even to McDonalds’ competition. There is clearly the potential for a positive feedback loop here. Elsewhere on the Network today: Human Transit shares some reasons why driverless vehicle tech will be a bigger deal for buses than for private vehicles. Spacing Toronto looks back at when the city first introduced crosswalks — it wasn’t exactly a victory for pedestrians. And Systemic Failure highlights a criminal misuse of the term “transit-oriented development” in Milford, Connecticut. Portland's Halsey Street carries five bikes in a normal rush hour. The city thinks dramatic upgrades can make it a model for suburban retrofits.